When reality-based issues, like matters of state, are discussed, why are impaired religious people consulted? The new leader of the ruling Kadima Party, Tzipi Livni, needs to put together a coalition government in order to become prime minister. One of the parties she had to schedule coalition negotiations with is an ultra-Orthodox Jewish party run by an octogenarian rabbi, Rabbi Ovadiah Yosef. 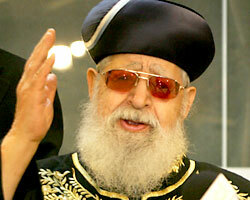 Rabbi Ovadiah Yosef has describ[ed] the Holocaust as God's retribution against the reincarnated souls of Jewish sinners. He said Katrina was punishment for godlessness in New Orleans and U.S. support for the Gaza pullout. And he once said that "walking between two women is like walking between two donkeys or between two camels." Dealing with this misogynist is going to be a real treat for a female prime minister. Exactly. And it's not just the misogyny; the man has a tenuous grasp on reality. Why is he permitted anywhere near affairs of state? I'll never understand why people don't see such fools as the con-men and scam artists they really are.